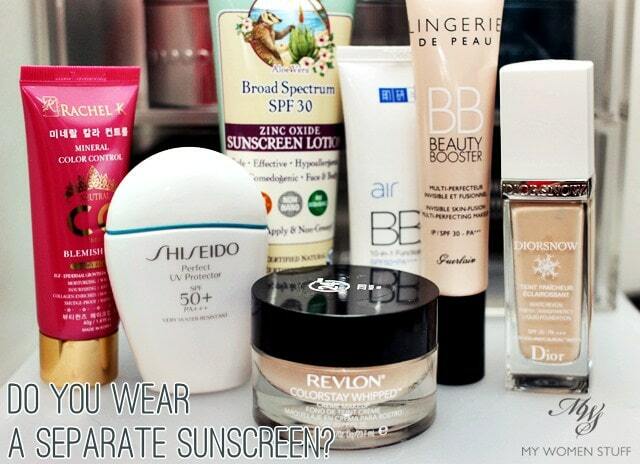 Home » Interesting Discussions » Your Say: Do you use a separate sunscreen or rely on SPF in BB Cream or foundations? Your Say: Do you use a separate sunscreen or rely on SPF in BB Cream or foundations? I think I already know the answer to this one, but curiosity gets the better of me all the time, as you well know by now. Many liquid foundations now sport SPF of at least 30 and up. Generally, the higher the SPF level, the thicker the formula which is why we don’t see many makeup bases that have very high SPF levels. The exception is with Japanese makeup because they’ve managed to give us light textured sunscreen with high SPF ratings. As for BB Cream, SPF50 is quite common. They are supposed to be “all in one” products after all, catering also for sun protection while giving you colour coverage. You may also realise that BB Creams come in a thicker formula, which can partly be attributed to this higher SPF. So, I’m curious. 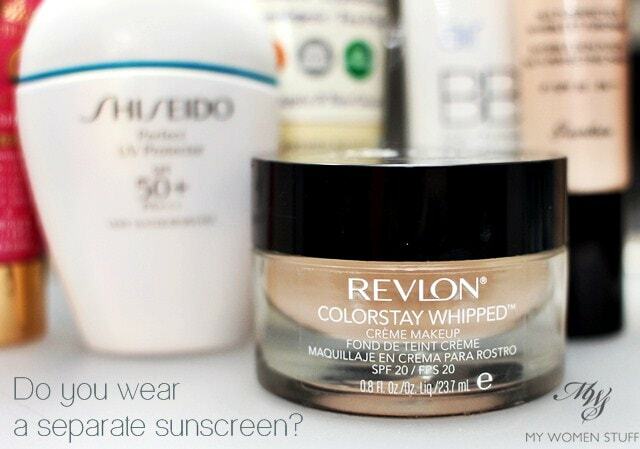 With all the high SPF base products out there already available to us, do you wear a separate sunscreen? Or are you rejoicing in the fact that the high SPF in your foundation or BB Cream allows you to get away with wearing one less layer of product on your skin? However, I do know that there are many people who don’t like wearing sunscreen or who cannot find a sunscreen that works for them, for whatever reason. Whilst I would say “Keep on looking! There’s one out there for you!” which rather sounds like looking for a life partner :P, it is true. You can keep on looking for a sunscreen that suits you. Yet, if for these people, they find that a BB or CC Cream with SPF works better for them for whatever reason, then I would say that having some protection is better than none. The only caveat would be that they may then have the false feeling of security and stay out in the sun too long. Or more importantly, do not use enough product to actually protect the skin. I do understand all too well the feeling of a layering a liquid foundation over a heavy sunscreen base. It was the reason I did not wear liquid foundation for many years, preferring to wear powder foundation. When I discovered lighter textured sunscreens that worked well for me (I use the Shiseido Perfect UV daily but you can read my thoughts on various sunscreens I’ve used over the time here) then I started opening up to the possibilities of wearing a liquid foundation, and loving the more natural look. So, is some protection better than none? I’d say it’s a toss up. If your skin really cannot tolerate ANY sunscreen in the market, for whatever reason, then I do suppose some protection by way of SPF in your makeup is better than none at all. Yet, I’d not recommend that anyone actually rely on the SPF levels in makeup simply because we never use enough. If we do, we’d look far too fake as our base makeup will be far too thick. Also, I would be a little wary about the over-promising that goes on in the BB Cream world. Do you wear a separate sunscreen under your makeup? Are you relying too much on the SPF in your makeup? Nope! Even if there was, we’d have to pile on the base and look like an opera singer LOL! I do sometimes wear the separate sunscreen under my makeup but it really depends what is the foundation that I used. I don’t like heavy feeling on my face though. Hence, I will prefer the powder foundation as well if I put up a separate sunscreen. However, I will occasionally just put up the CC cream with SPF in it after moisturiser. Whatever it is, as long as it did not make my face feeling heavy, I’m actually not too picky. I used to hate wearing sunblock but after reading some reviews from your blog and trying the biore, it was really good and now I wear sunblock and foundation/ bb cream. If I’m working outside in the sun, I apply a separate sunscreen. I’ve I’m just running errands I rely on my foundation sunscreen. I’ve been trying a physical one recently Natalie that doesn’t break me out! But it turns me so oily! Gah! Can only use it on weekends when I don’t wear makeup. Really? Zinc does that to you? A BA told me that sunscreen is a makeup item not a skincare item, thus a makeup remover or anything to its same effect must be used at the end of the day to completely remove it.. I guess thats why I am not keen on applying spf when I’m home, it feels like I’m wasting my makeup remover/ cleansing oil just to wash off sunscreen.. It also felt like a ploy to make me finish up my makeup remover faster and purchase more.. 😛 Do you use a makeup remover or double cleanse when its just skincare + sunscreen? I apply a separate sunscreen before I wear my makeup – extra protection from the sun can’t hurt – but I make sure it’s not super oily! My makeup stays on just fine! Good point about making sure it’s not a super oily sunscreen, Pam! And you’re right, every little protection we can get from the damaging UV rays can’t hurt. Like you I apply my sunscreen (Biore UV Perfect Face Milk SPF 50) after setting my moisturizer with facial mist and then only I will apply my BB cream. I feel that it gives my skin more protection and I apply sunblock on my neck as well so I don’t need to apply BB cream to my entire neck. That will definitely be a no-no cause BB cream could stain clothes. Ah so many people love Biore sunscreen, including you Kye Lin! 😀 It’s a pity Biore breaks me out or I might have a bigger budget for my sunscreens >.< You also made a good point about wearing sunscreen on your neck where you won't apply makeup! Good practice! Definitely a separate sunscreen for me, as I tend not to use too much BB cream / foundation all over, just to cover up spots or redness so I need a separate SPF! Definitely separate! If it’s daylight, I wear sunscreen year-round even if I’m inside during the cold Canadian winters. For the last few years, I’ve been using Anessa’s waterproof sunblock SPF 50+++ and found love its lightweight texture, which works well under any foundation I choose to wear over it. Another benefit to using sunscreen separately is when I do my makeup to go out in the evening, I don’t need to have something on my skin I don’t need. I likened sunscreen and those makeup products which also come with SPF protection like a camera phone and a compact camera or DSLR. Yes sure, these days with the ever revolving technology, camera phones comes in a 41 megapixel and Carl Zeiss lens among other impressive specs. A lot of people, myself including, are slowly stowing my good old point and shoot camera away…these days, you just whip out your smart phone and start to snap pictures of food or eye catching stuffs. But, undeniably, photos taken from a real camera will usually produce up to par results. I swear that my best friend’s several megapixel dinosaur age camera produces the loveliest photos ever without having to use a filter and what not. My conclusion is…sunscreen is produced and sold for a specific reason – to offer protection against the sun and harmful rays etc. While some may offer tinted versions to help even out skin tones, the core existence of sunscreen never changed. And who would fault a non tinted sunscreen? 🙂 As for makeup products which come with SPF protection, that is like a bonus. It will do its job to even out skin tones and offer flawless finishing, on top of that, it offers SPF protection but that’s really secondary and may not be what it does best. I started to use sunscreen only about two years ago. Remember my young and dangerous days? 😛 When I went for facial, my therapist would almost nag and yank her hair because I am just nonchalant despite being reminded that spots are forming underneath my skin based on the skin analysis. My mother started to jump and panic when she battled hyperpigmentation on her cheeks. That was when reality checked in for me. I agree with you that piling on sunscreen and BB cream may leave a heavy feeling on the face, more so when I have oily skin. But you’re absolutely right – there’s always a right one out there 😉 Just got to keep searching and of course reading. So far, I have found that Biore UV Perfect Milk for my T-zone and Hada Labo for my cheeks combination worked wonders. The moist effect from Hada Labo helps to spread the BB cream even better! Because Biore UV Perfect Milk can be too drying, it was great to use it at specific target areas. It irks me when women use their BB Creams/foundations/Powders as sunscreen. Like, seriously. Sunscreen should be worn separately. I don’t even trust moisturisers with built-in sunscreens. To me, moisturisers are meant to moisturise. Sunscreens are meant to protect your skin from the UV rays. And make up is, well, make up. I would think women living in a climate like ours would be a bit more informed about the importance of sunscreen – that it should be worn on its own. i don’t think i would ever apply enough bb/foundation (etc) to qualify as proper sunscreen, yet at the same time if a moisturizer i’m liking doesn’t have SPF i’m not terribly careful about applying one. :/ I need to get better at this for sure! Heh… as some people have pointed out Joyce, maybe in a different climate it might be ok to get away without wearing a separate sunscreen but in my weather, definitely a no no! I don’t use bb creams/liquid foundations etc. They serve me only in winter to protect my skin from wind and cold weather. And then i use daycream with spf 15 or 20.